Yes, it's another jewelry extravaganza... not surprisingly, Part 2 turned out to be as much fun to put together as Part 1! I'm sure there will be a Part 3 before long because I continually come across creatives who turn paper into eye-catching art. 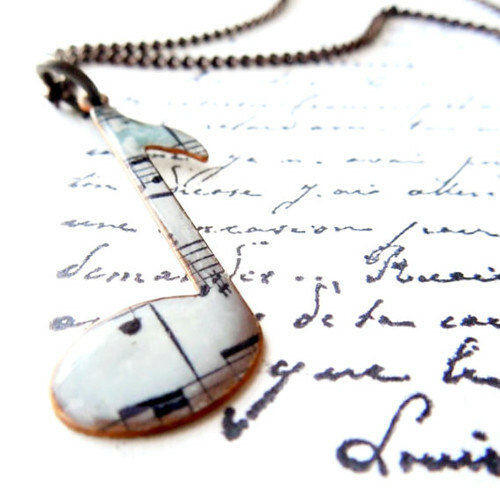 Although most people think paper isn't strong enough to be worn as jewelry, it is the rare piece that can't handle the task of simply swinging from an earlobe or hanging around one's neck. 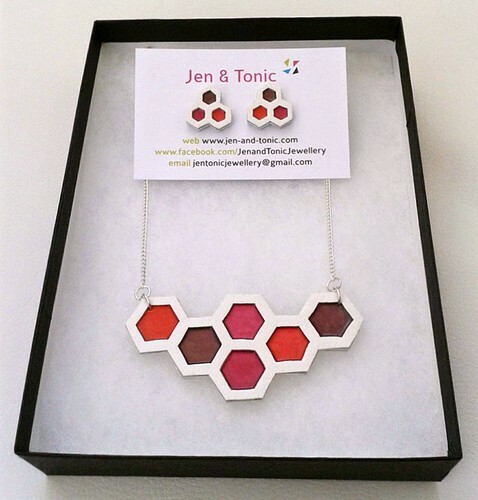 First up is Jen & Tonic - a name as clever as the colorful jewelry made by British artist and life coach, Jen Gosling. 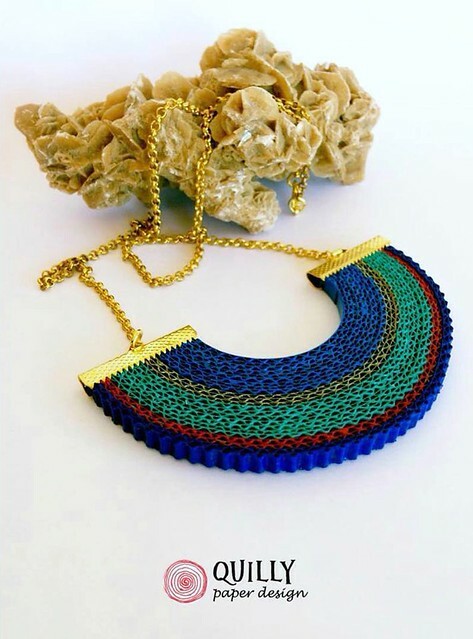 She prefers to use recycled and responsibly sourced paper to create her pieces along with recycled leather that adds durability and softness against the skin. 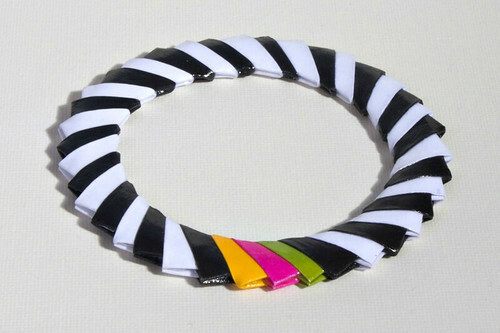 This geometric candy stripe bangle, part of Jen's GrownUp Allsorts Collection - a concept that makes me smile - is coated with a water resistant glaze, as is the pretty origami necklace below. 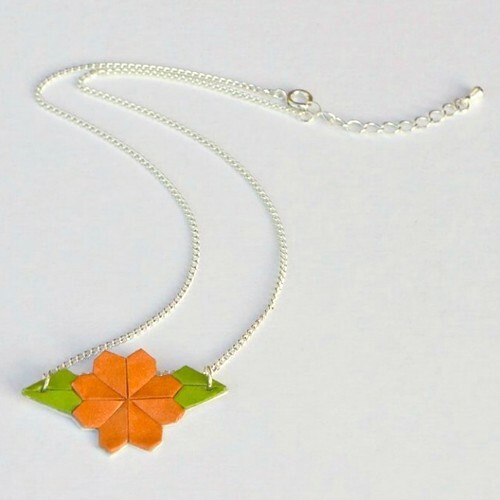 Jen makes each item to order and accepts commissions for bespoke pieces via her website and Facebook page. Enter code JenTonic at checkout for a 10% discount through May 31, 2016. Jen's life, creativity and wellness coaching website is Blank Canvas Coaching. Quilly Paper Design in Palermo, Sicily is owned by architect and teacher, Daniela Bonurelli, who became interested in quilling after giving her young daughter a how-to book. Just like Jen Gosling, Daniela appreciates the re-use of paper that would normally be discarded. 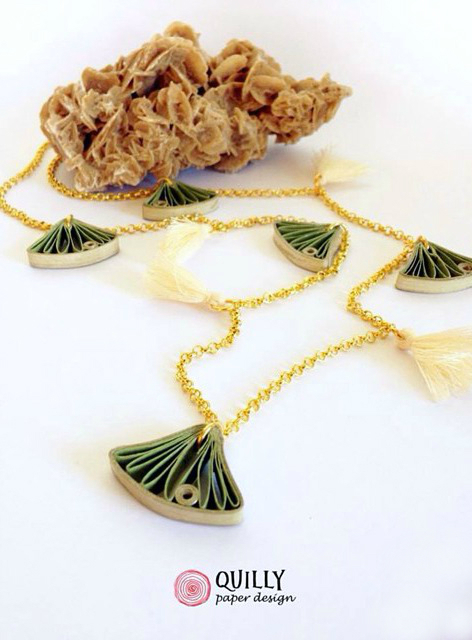 Creating unique pieces that capitalize on paper's ability to be flexible, yet strong is her passion, evidenced by these ginkgo leaf and corrugated necklaces, along with elegant metallic bead bracelets. Quilly Paper Design is on Facebook and Instagram. You'll rarely meet a person with a greater zest for life than Hilary Bravo, who resides in the small English town of Topsham. Her papier mache vessels and jewelry were first featured in this post, and in the intervening time she has continued to create treasures from found and simple materials. 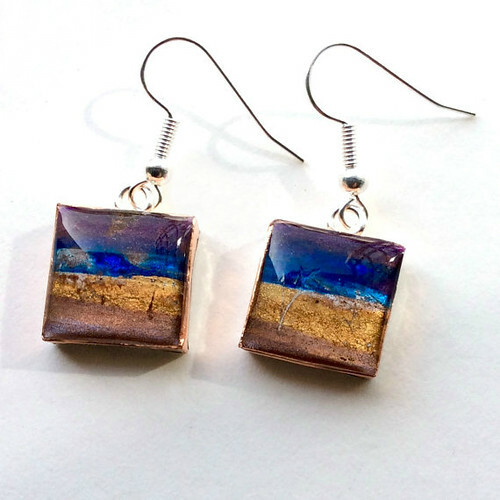 Contemporary earrings, brooches and necklaces that look enameled are actually paintings by Hilary that she cuts up, sets on papier mache and finishes with copper tape edges and aluminum backing. 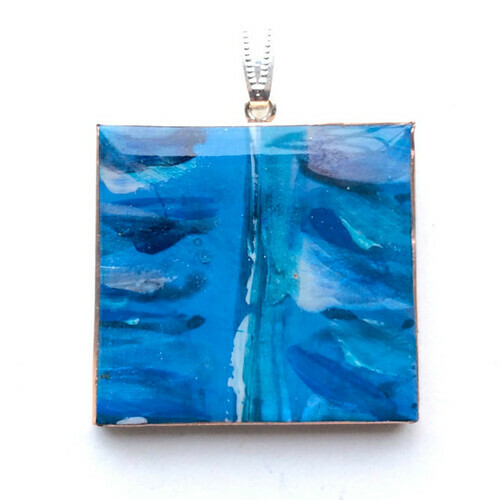 A resin dome magnifies and intensifies the colors. Hilary delights in sharing techniques she has developed over the past twenty years via one-day workshops in her South Devon home studio. She shows how to make papier mache resemble other mediums... for example, glass-like beads that look remarkably like ancient Roman brooches. She has a You Tube channel, is on Etsy, Facebook and Pinterest, and sells her work via galleries and museum shops. Besides paper, something all of these artisans have in common is a knack for sourcing unique findings to enhance their designs. 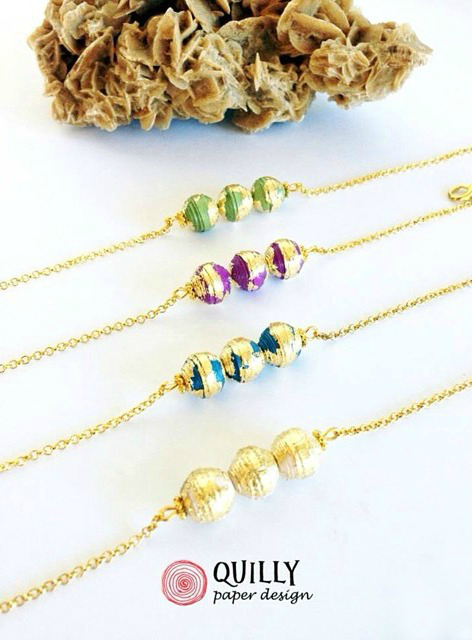 Pretty chains, beads, wire and clasps make all the difference. Susan Alvarez Johnson of SusanAnna in North Carolina is a great example of this. 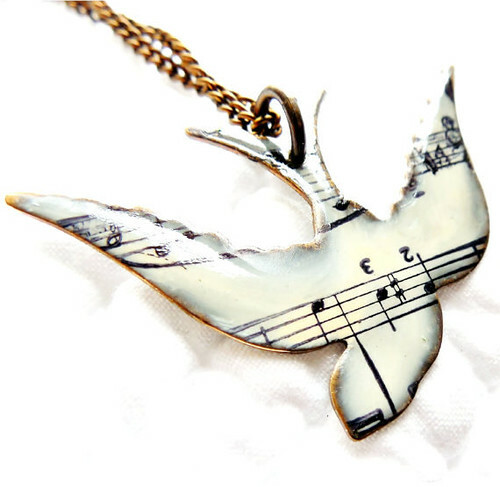 Susie began making jewelry as a hobby about seven years ago and stocks her Etsy shop with a variety of pieces including hand painted songbird and musical note pendants that begin with sheet music placed on nickel and lead-free brass bases. 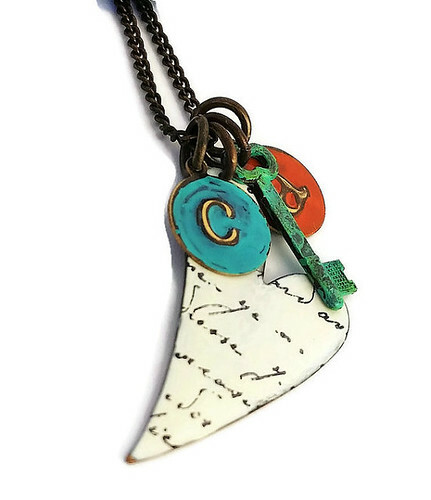 The heart necklace features love letter paper, initial charms that are pressed and painted to create a distressed look, as well as an altered key. 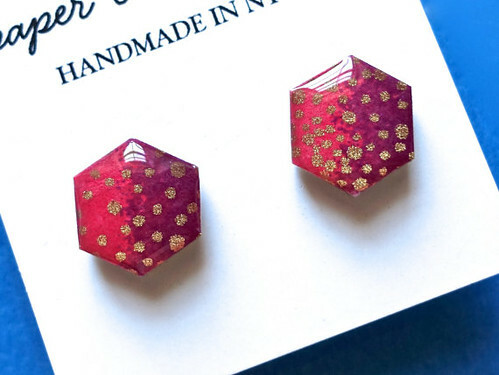 Jewel Suzuki of *Paper*Crane*Heart* in New York City makes stylish chiyogami paper jewelry. She spent a portion of this past winter in Japan sourcing papers and making stock for her Etsy shop and the many craft shows she attends each year. 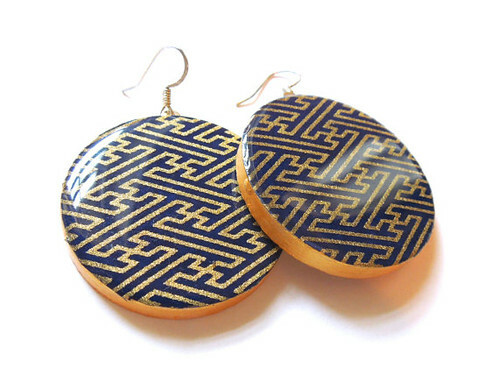 Jewel's resin-coated earrings and necklaces are handmade from wood and Japanese paper. 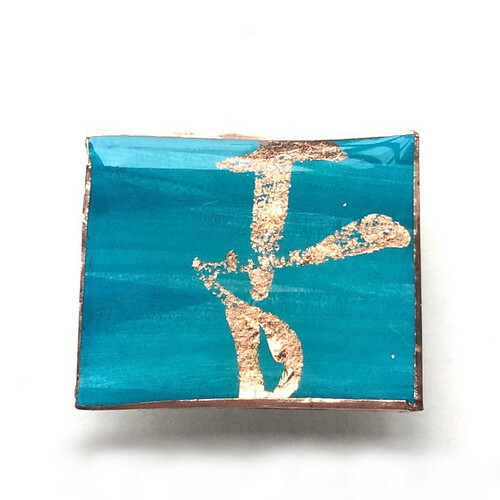 Nicely finished on the reverse side with gold paint, they are water-resistant, super-lightweight and have hypoallergenic surgical steel earring hooks. 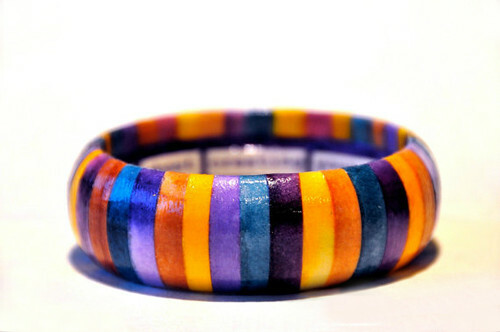 She also decoupages wooden bangles with paper strips and places a little text message on the interior. Etsy shop purchases are 15% off with the coupon code ALLTHINGSPAPER, valid through May 31, 2016. What beautiful pieces in this collection!! Love the round beads!!!! Everything is sooooo well done! I'm happy you enjoyed the post, Honey and Jan. Thanks for commenting! Glad you liked it, Steffi, thanks! Can't believe that they are just paper design, wow!! So beautiful! Thank you for sharing! !